Please Note: This unit can only be purchased with the appropriate surface or flush mount. An IP access control unit that lets users open a door using Bluetooth technology (BLE) and a smartphone or tablet. All you need is the 2N® Mobile Key installed on your mobile device. 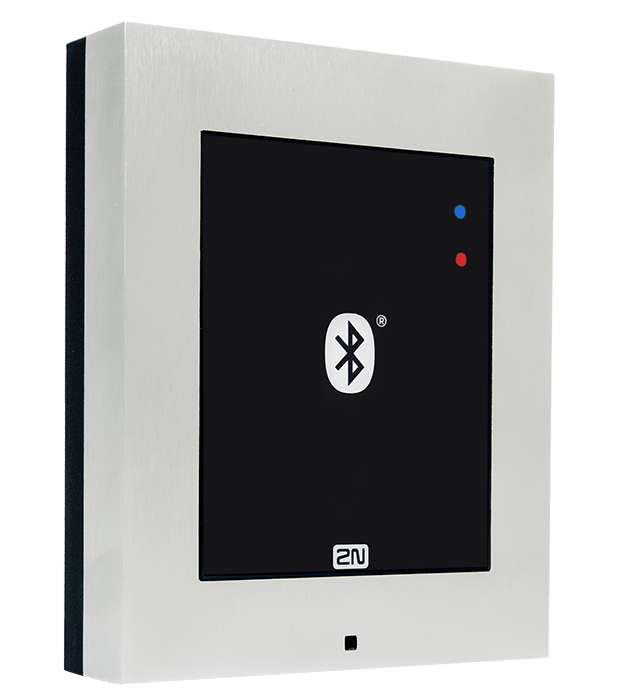 The 2N® Access Unit Bluetooth also supports two-factor user identification and is designed for locations with high security levels. Choose, whether the user opens a door through an application in their smartphone or keeps the phone in their pocket and opens the door by simple touching the unit. Unlike our competitors, 2N offers free mobile credentials. Other providers may charge you $6 to $10 per each credentialed user’s ‘virtual card.’ Simply install the 2N app and use its convenience and safety without further fees! Thanks to Bluetooth v4 (BLE) technology and encrypted communication between the access control unit and the 2N® Mobile Key application, your access details cannot be misused. You simply pair your mobile telephone with the access control unit in just three steps. To pair several units at once, you can use 2N® Access Commander. Set the mobile telephone’s range for opening doors according to the type of installation – long distance for garage entry or short distance for passing through turnstiles. For an extra level of security in guarded areas, for example, outside regular business hours, two-factor authentication can be set requiring users to confirm their identity by combining one mode of door opening with a PIN code entered in the application. 2N® Access Unit Bluetooth is equipped with a mechanical protective switch. As soon as anyone attempts to damage the unit mechanically, the switch is activated and an alarm is set off. Other expansion modules (e.g. an exit Bluetooth module, RFID reader, or keypad etc.) can be connected to the 2N® Access Unit Bluetooth, allowing you to secure a door easily from both sides. Thanks to its mechanical properties, the access unit is designed for either indoor or outdoor installation. Thanks to the 2N® Access Unit Bluetooth and the 2N® Mobile Key application, you no longer need to pay for each new or replaced RFID card. Our application replaces these cards and is free of charge.